Our infusion sets allow the animal freedom of movement during long-term infusion. The complete assembly may be removed to facilitate the conduct of in-life investigations. Completely integrated rodent infusion systems providing maximum procedural flexibility and precision. Infusion sets may be purchased complete or as individual components and are also available pre-sterilised. All equipment is standardly available in a range of sizes. However should your size not be mentioned above, you may always call us for information on custom made products. 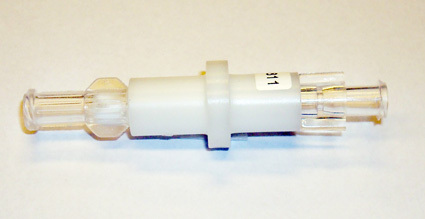 Rodent swivel retainer; Constructed in stainless steel and plastic; used to mount the swivel to the outside of the cage; preventing the rodent form accidentally gnawing the swivel and the top of the catheter; allows for easy removal of swivel and entire assembly; available for all types of cages design. 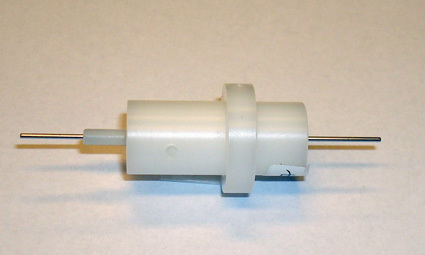 Rodent swivel; Available in both high-impact plastic and stainless steel; the needle gauge of the swivel is selected according to the inside diameter of the catheter. Rodent swivel - tether connector; Joins the rotating end of the swivel to the top of the tether; high impact plastic construction eliminates sharp edges, thus reducing risk of damage to the catheter; facilitates 360º rotation of the system. Rodent tether; Manufactured of stainless steel for durability; the tether end is molded onto the unit for use with the rodent jacket. A plain tether is designed for use with the tail cuff and attaches directly to the tail cuff. Select appropriate tether length according to the dimensions of the animal's cage. Rodent tail cuff; Used as an alternative to the rodent jacket; constructed of stainless steel; compatible with all other items in the rodent infusion set. All rodent jackets come with standard inserts. Custom inserts like dermal or pocket inserts are also available.